How’s that saying go, “Even a broken clock is right twice a day”? Well, I would compare Sarah Palin to a broken clock, but I don’t want to insult the clock. 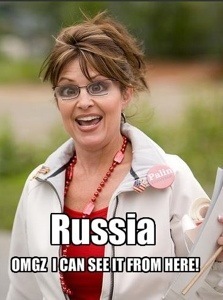 Since Palin first burst onto the scene in 2008, I pretty much always knew she was a babbling idiot. Sure, she plays well to crowds of imbeciles who fall prey to the “hockey mom” shtick she tries to portray herself as – but the reality is, she’s just not an intelligent person. I’m sure many of you have heard that Sarah Palin made a “prediction” back in 2008 that if Obama was elected president, considering his stance on the Russian invasion of Georgia, that it would probably tempt Russia to invade Ukraine. Let’s not pretend like she used some intricate knowledge of foreign policies to come up with her “prediction.” All she did was utilize a situation that at the time was a fairly large conflict, then pointed out the next logical country with which Russia might do the same thing. The situation in Ukraine has nothing to do with Obama being President of the United States. If that’s her stance, did Bush’s policies (and handling of foreign affairs) lead the Russian government to invade Georgia? Because we can’t gloss over the fact that the Russian invasion of Georgia happened before Obama was elected president. So how could what caused Russia to invade Georgia be the same thing that has now led to Russia sending troops into Ukraine, considering these events happened under two different presidents? And let’s not forget that the unrest between eastern Europe and Russia has been going on for decades. This isn’t something that just magically sprung up in the last five years. Palin’s comments, seemingly trying to take some kind of credit for this “prediction,” only serve the purpose of showcasing how much of a fool she really is. She cherry-picked one comment out of her thousands of absurd claims and is now trying to pass it off like she was some savant who knew exactly what would happen if Obama became president. But the worst part is the conservative media (and those misguided conservative voters) are falling all over themselves to point out Palin’s “intelligence” by getting this “prediction” accurate. Doesn’t this whole situation tell the story of just how ignorant this woman really is? After 5 years, she’s now basing her argument against her detractors completely on a claim with which she essentially just got lucky. One claim, one “prediction” out of thousands of absurd claims and predictions she made. Though I doubt she, and her millions of loyal followers, are intelligent enough to really understand that. Previous Putin raises his head! Next “Noah” The True Bible Epic! If Palin is not one to say “I told ya so” it’s because she’s so rarely right about anything.